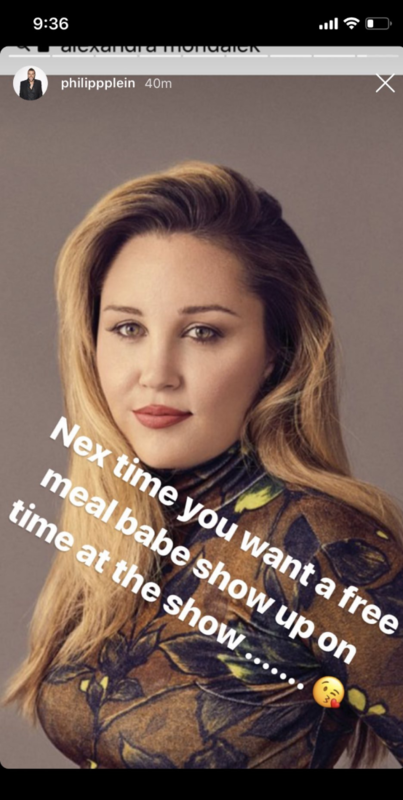 A fashion journalist is speaking out after a designer fat-shamed her to his 1.5 million followers on Instagram after she wrote a critical review of his New York fashion week show. Alexandra Mondalek is a freelance writer in New York City who has written for publications like Racked/The Goods, Fashionista, Yahoo Lifestyle, and more. This week, she has been covering New York Fashion Week. She received an invitation to cover Philipp Plein's show, which was held at a restaurant called the Grill in Midtown Manhattan. Mondalek told BuzzFeed News she had covered Plein before, in a reported feature for Yahoo Lifestyle in 2017. Plein is known for making a spectacle of his runway shows, and this year's show already was full of drama. Last week, TMZ reported Plein was scammed out of almost $1 million by someone pretending to be a rep for Kanye West, who promised West would perform at the show. When Mondalek arrived at the show Monday night, she said she was less then impressed. For starters, she had been told the dress was black-tie and to expect a sit-down dinner. Only some people got a meal though, and she and others were squished into a standing-room-only area above. This situation was not only uncomfortable, she said, but it made it difficult to see the clothes. Which, she added, she was not impressed by. “I don't have any delusions of grandeur of who I am when I go to show," she said. "But I do expect a modicum of professionalism." On Tuesday, Mondalek filed her review of the show for Fashionista, in which she eviscerates both the quality of the show and Plein's clothes. 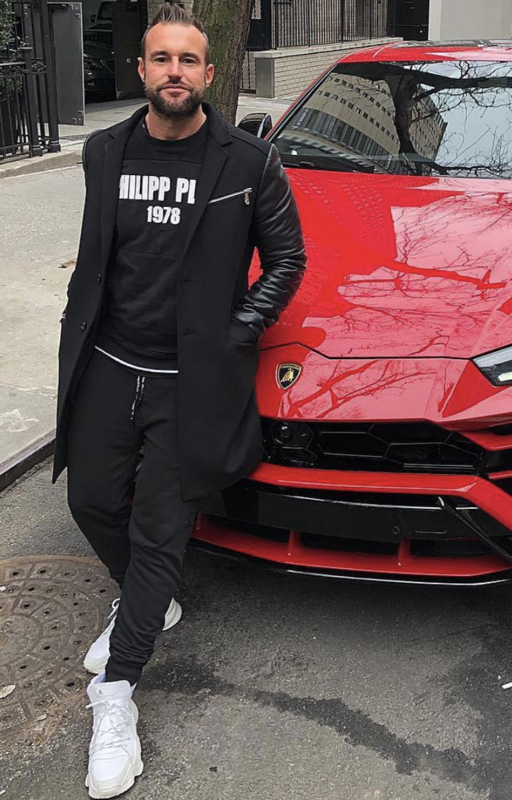 "The Philipp Plein brand is a tacky joke, one contrasted so starkly against a backdrop of other designers in New York doing their best to be humble and tell authentic, compelling stories about what fashion means to them and to an ever-changing world, despite their varied levels of success," she wrote. Later in the day, Mondalek noticed something concerning. She was getting rude DMs on Instagram, from people calling her "fat and ugly." She then found out why. Plein had called her out personally on his Instagram page for her review. First he criticized her journalism, with a photo of Patrick from SpongeBob eating a burger. He then posted a photo he found of Mondalek on the internet, and body-shamed her. "Next time I make sure that you will get enough food! I promise," he wrote. He kept posting messages, using an emoji to call her a "clown" and for some reason posting a photo of Amanda Bynes. "Next time you want a free meal babe show up on time at the show," he wrote. Mondalek maintains she was on time. Mondalek's initial response to Plein's post was to feel upset, embarrassed, and angry. She was horrified that Plein would attack her so publicly over the way she looked. “It's one thing to critique a body of work, it's another to review somebody's body," she said. She decided to post the screenshots on Twitter, even though she was tempted to bury her hurt and make it go away, because she thought Plein deserved to be called out. “The crux of all of this is what he did was really disgusting," she said. BuzzFeed News has contacted Plein about his comments, which have since been removed from Instagram. Mondalek said she hopes to shed light on the fact that we have a long way to go on body positivity. “I'm hoping that in doing so it gives other people the courage to stand up to anyone to makes them feel bad about themselves," she said.